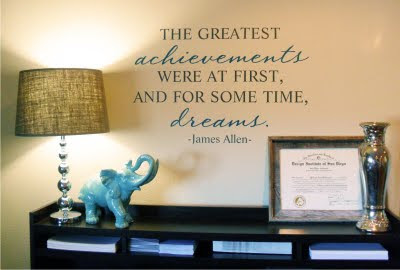 This photo graces the wall of a home office and is a fantastic reminder that some dreams take awhile to come to fruition. 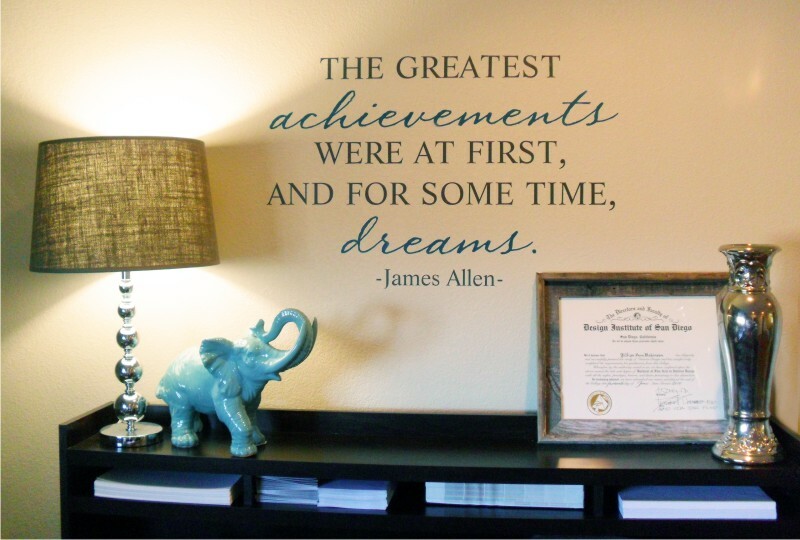 And that really, "some of the greatest achievements were at first, and for some time, dreams." Thanks for sharing this photo, Jill! Do you have a favorite inspirational quote? We're working on revamping our inspirational collection and have so many great quotes at our disposition. But I'd like to know what inspires you. So please - leave a comment with your favorite quote. And as a special thank you, we're going to choose one (at random) and create a custom design just for you. You decide the font, layout, size and color. I'll send a proofs throughout the process for review - just like we do for custom designs. And then - you get to see it every day in your home or office or, well, wherever. No charge. Just 'cause we appreciate your help and all need a little inspiration now and again. *But just so you know - you'll likely be the first, but not the only with this design - we'll include it, along with all of our other favorite designs ('cause there are dozens of those!) in our new Inspirational wall quote collection. "Never get so busy making a living that you forget to make a life." Although I cannot find who said it. I also like the thought provoker "What would you attempt if you knew you could not fail?" Dr. Robert Schuller. I like this one without the second half of it (which is "You're on your own. My step-daughter loves this one, and if chosen I'd put it in her room. These are all really great; thanks so much for sharing. Keep 'em comin', folks! -George Bernard Shaw, "Mrs. Warren's Profession"
but that doesn't mean we can't get on the train to somewhere better.